Have you spent money on complex and costlier barcode label makers and still not able to create your own customized barcodes? Just go for Data Doctor’s BarCode Label Maker that creates your own style barcode labels, stickers or asset tags. Barcode Creator Software provides solution to maintain data accuracy with reduced error rates and speedy data access. Barcode Creator Utility supports major Linear and 2D barcode symbologies such as Code 93, Code 128, UCC/EAN-128, Code 39 Extended, Interleaved 2 of 5, POSTNET, DataMatrix, MaxiCode and much more. 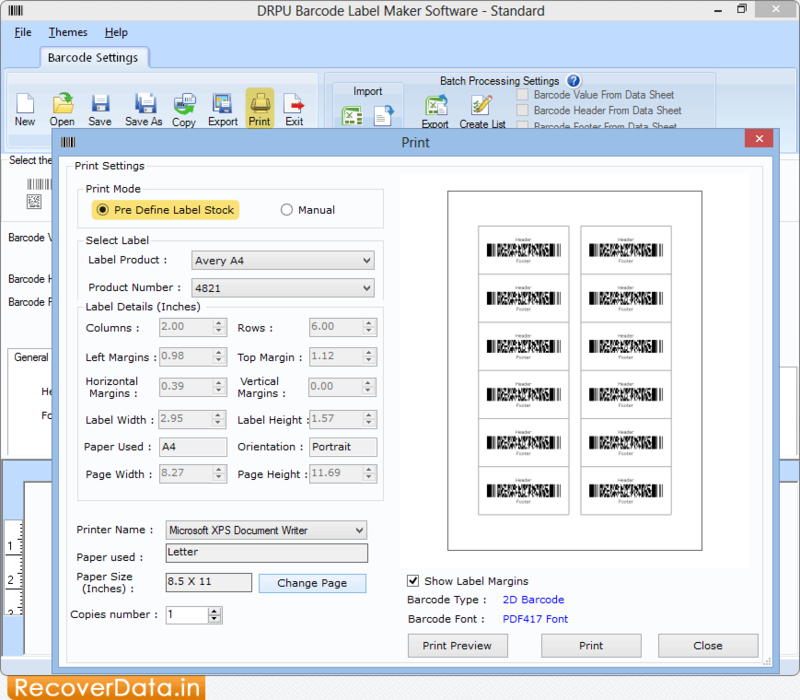 Barcode Generator Program creates barcode labels using different barcode designing objects including text, line, round, rectangle, arc etc. It allows you to save barcode images in a variety of formats, such as BMP, JPG and GIF etc. Barcode Label Creator generates barcode labels, stickers or asset tags with support to major barcode font standards that can be easily scanned by barcode scanner. Barcode Label Maker Software designs barcode labels using sequential, Constant value and random series generating techniques. Software enables users to print multiple barcode labels using advanced print settings. Generate barcode labels, tags, stickers, etc in linear or 2D barcode fonts. Barcode images can be saved in jpg, gif, EMF, EXIF, GIF, bmp and other similar file formats at user specified location. Facility to print multiple barcode labels on a single paper using advanced print setting option. Software provides facility to add generated barcode labels to different Windows applications such as Word, Excel, Paint etc.